Spring and summer are popular times for homeowners to update landscaping or build backyard staycation amenities like patios, island grills, swimming pools, and outdoor kitchens. Although the temperature may be warm and pleasant, bad weather can make a surprise visit. An unseasonal rain shower can do worse than make you regret storing your winter raincoat; it can wreak havoc on the pace of your home improvement plans. The nicer the weather—and closer to completion your project is—the tougher it can be to face a construction lag at your home. With this in mind, it’s important that pool contractors provide candid information to those considering a new pool or who have one underway. Knowing what could happen—and why—may not make your pool completion date come any quicker, but it can make the bad news a bit easier to handle. Wet Weather Problems: Rainfall can impact a job site in a number of ways, but more challenges arise during the earlier construction phases—after excavation, but before the application of concrete (gunite or shotcrete). Understand that inclement weather can slow outdoor construction. When it comes to building gunite pools, it’s an understatement to say that weather delays are an unpopular topic. However, it’s important to know that before Mother Nature brings you—or any swimming pool buyer—days of sunny poolside fun—she could rain on your construction parade: Unfortunately, weather delays are something that all pool contractors and some of their clients will have to face. What can be confusing and particularly frustrating for pool buyers everywhere is how delays can be longer than the duration of the inclement weather. In other words: one day of rain does not equal a one-day work stoppage in construction. Let’s take a look at some of the key reasons why. Construction sites can’t be wet—and drying out takes time. To begin with, pool building requires a dry construction site. After rainfall, and before crews can proceed, the soil needs to dry out so that only minimal moisture remains. The ground must also be hard enough for heavy machinery, such as an excavator, to drive over it without getting mired in mud. Depending on backyard conditions, the ground may take several days to several weeks to be ready. Local factors extend or reduce the time needed. For example, in areas of the country where the ground contains more clay, water will remain longer in the soil before evaporating. However, if the ground contains more sand, the residual water will evaporate more quickly. Other recent weather conditions can come into play. Let’s say that a week before pool construction began, there was rain or melting of ice or snow—either of which meant that water seeped into the ground. Now, a week later, construction is underway. Rain comes again. Due to existing moisture in the ground, the dry-out period will take longer than it would have had the ground not already been damp. Yet another possible variable to the time needed: Excavation. 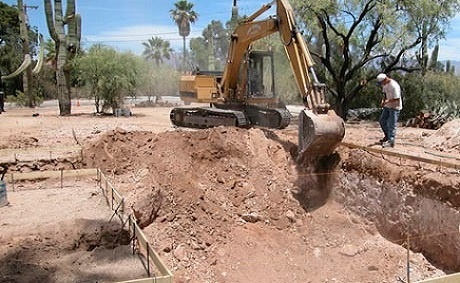 If this construction phase has already occurred, and there is an “open hole”—as pool builders refer to them—rainwater may get trapped inside it. On some projects, this water stays put—usually in the deepest part of the hole. It could take weeks to evaporate. If this is the case, a builder will need to schedule and send a crew to drain the water, and that extra step in the process may slow the pace of construction. Dry Ground Needed: Along with making the soil too wet for crews to resume work, rain can mean other negative consequences to the pace of your pool’s construction. Rainfall can damage an excavated pool hole, collapsing its walls. You pool builder will eventually transform a freshly dug pool hole into a beautiful, lasting backyard resort. However, while the hole is still open, it’s especially vulnerable to rain. Soaked by showers, soil from the hole walls can easily crumble and fall into the bottom. 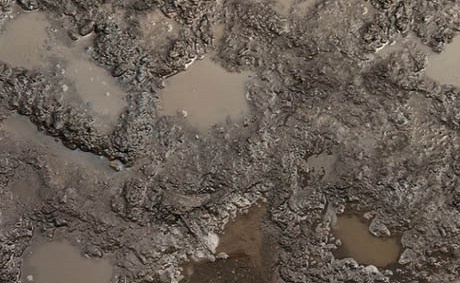 Precipitation that comes in torrents and with gusts of wind can knock even more soil loose, creating a mess of sludge inside the excavated site. What can make an open hole even more susceptible is the status of the pool plumbing. This phase includes digging a trench around a pool-hole perimeter to house the pipes. If still open when the rain comes, the trench can fill in with varying amounts of water and collapse the walls of your future pool. In a small backyard where a pool is being built close to your house, another potential culprit is your roof. Yes, your roof. It can magnify the effects of rain—but only in certain cases: That’s if your roof has no rain gutters and its angle focuses the run-off to a single area that pours into the pool site. The continual drenching in one spot can cause a messy, sloshing failure of the open hole. Tip: Consider yet another reason to address rain gutters and backyard drainage. Once your pool is completed and operating, a lack of or poorly configured roof gutters can create ongoing flooding issues for your pool and deck. When the pool hole walls collapse and the falling soil spills out in a substantial portion of the hole, it’s called a cave-in. You don’t want one, and neither does your pool builder! Depending on a number of local factors, such as weather forecast and soil conditions, your builder may take proactive measures to avoid this calamity. To pre-empt a cave-in or minimize its impact, a builder may protect the hole’s walls and bottom with a method known as flashing. It involves applying a thin coat of gunite or shotcrete to the interior of the hole to keep the walls intact and soil in place. Pool builders are more likely to use flashing in anticipation of heavy rain. If the forecast is for something lighter, they may opt for tarps. This method involves draping plastic sheets along the hole’s perimeter walls and securing them with bricks or other weights. However, in cases where rain was unexpected or when a forecasted drizzle becomes a deluge, advance measures may not be in place. If so, an excavated pool hole is like a sitting duck: The dirt walls may fully or partially cave in, collapsing into one or more piles of mud. When cave-ins occur—whether at your backyard or someone else’s’—construction schedules will certainly take a major hit. Even when conditions are dry, wind can interfere. In addition to delays created by rain or snow, wind can sideline progress. Even after the concrete phase and the solid pool shell is in place. In particular, the phases involving the pool’s interior finish and the patio decking may have to be postponed. For example, crews cannot apply the pool plaster finish during gusty winds that could blow sand, leaves, or other debris into the smooth, freshly applied material. Another issue is that high winds could cause the plaster material to dry out too quickly. That can create what’s known as check cracks—a series of tiny, spider-web like flaws. The same goes for any kind of concrete decking, whether it’s poured, troweled, stained, or stamped. Concrete needs to set and properly cure—without wind introducing unwanted matter that could blemish its appearance. Another harsh reality to consider is the domino effect. 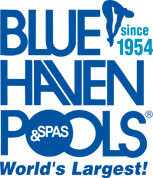 Typically, pool builders have multiple jobs that are simultaneously under construction. When it showers on several pool sites, even a modest downpour can throw a cascading wrench into construction schedules for everyone. This domino effect even can occur when you would never expect it. In the construction industry, it’s the phenomenon known as a “sunshine delay”: Even if a single drop does not fall at your house, a downpour in another part of town may waylay crews from finishing work on another pool. That in turn, holds up the crew’s arrival to work on your pool! Keep in mind: Even if your project is the only one currently under construction with your builder, the domino effect could still hit you. Pools under construction by other companies can ripple over to your project. That’s because it’s common industry practice for pool builders to use subcontractors who specialize in certain trades, such as steel or concrete. Subcontractors work on multiple projects. As a result, its crews might take longer to reach your job due to problems on ones belonging to projects at other pool companies. The wait is warranted—and will pay off in the long run. Naturally, weather delays can be trying for anyone waiting for their new pool to be completed. Do keep in mind that you and your builder will be on the same page regarding your pool’s completion: Like you, your pool contractor wants to finish as soon as possible! A good builder will also want to ensure the integrity of the pool structure—even if that means taking longer. Maintaining quality requires not taking risks during construction that could adversely impact the end result! Would you want your builder to gamble on your new pool? For example, should they install ceramic tile in freezing temperatures if doing so could mean the mortar is failing to properly bond the tile to the pool wall—eventually causing them to separate? A pool is a major backyard addition. Ultimately, a well-built one will add beauty to your home and give your family years of enjoyment—all making any extra wait well worth it!